In this poem by Lidija Dimkovska, the full stops at the end of each word raise more questions than the simple answers they appear to be. These categories create both lack and excess in meaning when stripped from their contexts—there is a sense of isolation but at the same time a certain kind of clarity that in life, for better or worse, we often move from having just one home to having many. except the citizens have either died or moved away. at the border of the earthly, or the heavenly kingdom. passing the same pen from one to another. Lidija Dimkovska was born in 1971 in Skopje, Macedonia. She is a poet, novelist, essayist, and translator. She competed her PhD in Romanian literature at the University of Bucharest, Romania where she worked as a lecturer of Macedonian language and literature. 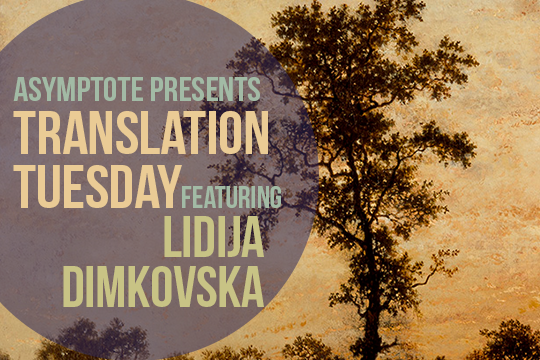 She lives in Ljubljana, Slovenia and translates Romanian and Slovenian literature to Macedonian. She has published six books of poetry and three novels, translated to more than 20 languages. She received the German poetry prize “Hubert Burda,” the Romanian poetry prizes “Poesis” and “Tudor Arghezi”, the European Prize for Poetry “Petru Krdu” and the European Union Prize for Literature, among others. In the States, The American Poetry Review in 2003 dedicated the cover page and the Special Supplement to her. In 2006 Ugly Duckling Presse from N.Y. published her first collection of poetry in English, Do Not Awaken Them with Hammers, and in 2012 Copper Canyon Press published her second book of poetry pH Neutral History (short-listed for the Best Translated Book Award 2013). Ljubica Arsovska is editor-in-chief of the long-established Skopje cultural magazine Kulturen Život and a distinguished literary translator from English into Macedonian, and vice versa. Her translations from English into Macedonian include books by Isaiah Berlin, Toni Morrison, Susan Sontag, and plays of Lope De Vega, Harold Pinter, Edward Albee, Tom Stoppard, and Tennessee Williams. Her translations from Macedonian into English include works by Lidija Dimkovska, Dejan Dukovski, Tomislav Osmanli, Ilija Petrushevski, Sotir Golabovski, Dimitar Bashevski, Radovan Pavlovski, Gordana Mihailova Boshnakoska, Katica Kulafkova, and Liljana Dirjan, among others.